The company stands accused of obstructing the federal probe in the 2010 blast and 12 pipeline safety violations. Testimony ended Friday in the PG&E federal pipeline safety trial with company producing maps showing hundreds of workers and executives lived near the six major gas pipelines at issue in the case. The company stands accused of obstructing the federal probe in the 2010 blast and 12 pipeline safety violations. On Friday, defense lawyers presented several detailed maps showing the course of pipelines and blue dots marking the homes of PG&E workers in Daly City, Walnut Creek, Watsonville, Fremont and Sunnyvale at the time of the gas pipeline explosion. Company lawyers had fought to use the maps as evidence that no one in the company would intentionally compromise safety or jeopardize their colleagues’ lives. Supervising engineer Calvin Lui testified that one line came near to where his family lived in Fremont. “I lived there 18 years of my life,” Lui told defense attorney Margaret Tough. Another line, he said, was near where his grandmother lived in Daly City. It was Lui, then straight out of college, who had been tasked in 2010 with justifying the company’s decision not to inspect over-pressurized at-risk pipelines – a key issue in the case. Federal prosecutor Hallie Hoffman asked him if he mapped the areas where normal people -- not just PG&E employees -- lived around the at-risk pipelines that the company failed to inspect. She also asked whether Lui knew exactly where the managers who opted not to inspect the lines at issue in the case lived around those lines. "No, I don't know where all my co-workers live," he responded. Hoffman noted there was no map of the community of San Bruno, which was devastated by the blast. She pressed Lui if he knew the location of homes of those who prosecutors allege failed to track records of federally mandated integrity tests of gas pipelines. "I don't know who all these people are,” he said. “I don’t know where they live." At that moment, the defense rested its case and prosecutors said they would not call any witnesses in rebuttal. Earlier, another PG&E witness came under fire from prosecutors. David Harrison, a veteran consulting engineer, testified that he oversaw high pressure water pressure testing of the company’s pipelines. The company called Harrison to introduce more recently found records of such tests that the company previously had said were missing. 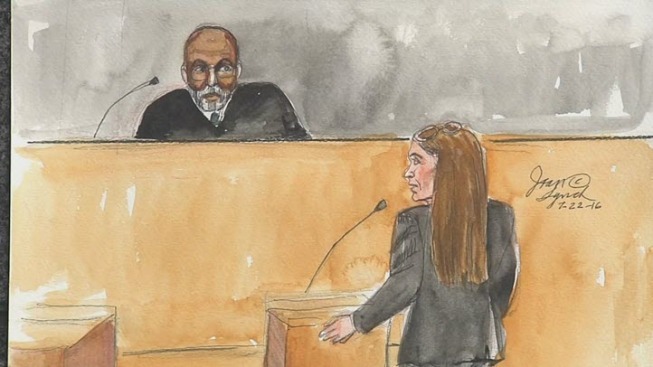 Prosecutor Hartley West showed Harrison an analysis he worked on after the blast that reflected dozens of question marks and missing data fields about the San Bruno Line 132 and Line 109, which runs parallel from Milpitas north to San Francisco. Harrison said the although the spreadsheet data suggested missing data related to required pressure tests, he would not say that it was in fact missing. He added that what followed was a three-year long data search to come up with records to vouch for the San Bruno line and other sister lines in the Peninsula. Closing arguments are set for Tuesday in the case. If convicted, the company could face as much as a half billion dollars in fines.